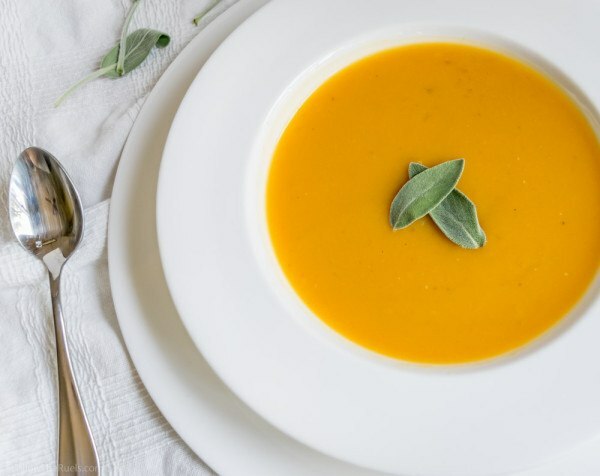 An easy and healthy butternut squash soup recipe for Fall. Preheat oven to 375. Arrange butternut squash cubes on a large baking sheet, evenly and in one layer. Sprinkle with salt and pepper. Bake for about 20 minutes, or until soft. In a large pot over medium heat, saute onion in olive oil until translucent, about 5 minutes. Add butternut squash and stock. Bring stock to a boil. Reduce heat, then add Greek yogurt and spices. With a immersion blender, blend the soup until smooth. Serve immediately, topped with sage leaves.